Gold Eagle 104+ Motorsports Octane Boost and Complete Fuel System Cleaner is double the octane boost of our original 104+ formula. The maximum formula will maximize power and acceleration, gas mileage and clean fuel injectors and the entire fuel system. Maximum 104+ is safe for all catalytic converters and oxygen sensors. A single use of 4 ounces treats 7 gallons and will help remove water and improve your performance. Add entire contents of bottle to gas tank and fill with fuel. One bottle treats up to 5 gallons. 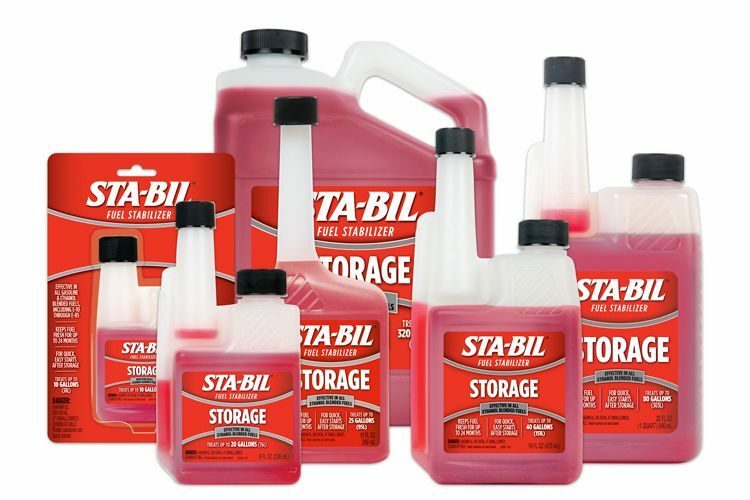 Safe to use in all gasoline blends, including Ethanol. Perfect for use in motorcycles, ATV’s, snowmobiles and jet skis. 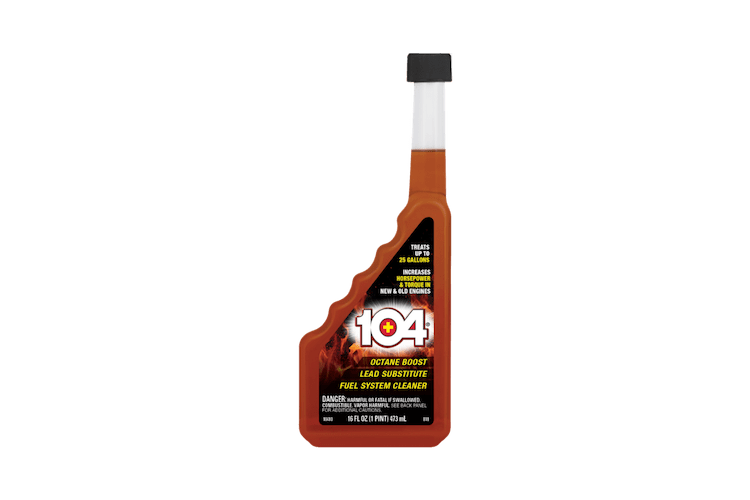 104+® Octane Boost Motorsports is rated 4.7 out of 5 by 43. Rated 4 out of 5 by Lumpy from Vroooom! I gave a bottle of Powersports 104+ Octane Boost to a buddy who was trying to get his son's old motocross bike up and running after a few years locked in the shed. He replaced the spark plug, fuel line and hoses and cleaned out the gas tank and fuel system. He didn't have any race gas and complained about the quality of the fuel he'd been buying for his truck at the store up the road (they live out in the country) and didn't think the bike would run very good on the same stuff. So, he added the 104+ to the first tank since the refresh. Fired on the first kick and ran like a bat outta ... well, you know. I don't know if it was his expert refresh, or the 104+, or a combo, but it sure ran great. Rated 5 out of 5 by Craig from Gave it a try. Received this 104 Octane Booster as a sample and was wandering what to use it on. The last time I had my Harley out for a ride I heard some pinging in the engine when it was pulling a hill. Poured this in a full tank of fuel and went for a 78 mile ride and never heard any pinging under any pulling conditions. Seems to have been helpful and plan on using it in the future to supplement the poor fuel quality available. Rated 4 out of 5 by Autobroker from Saved the day This product saved the day when Hurricane Matthew was approaching a day out my neighbor came over & was having a problem starting their generator. I wandered over & put some fresh 90 non Ox fuel in the tank. Gave it several pulls & no go. I went back home Got a syringe Mixed up a small bottle of fuel With a SMALL amount of Powersport 104. SMALL is the keyword here & proceeded to squirt a small amount of fuel into the carb with the syringe & pulled the recoil & it fired & soon stopped. I squirted another dose of fuel into the carb & it fired again this time as it was stalling out I sprayed more fuel into the carb to keep it running until the syringe was out. 4 more times. At that point it kept running on its own. I added a small portion of the 104 to the fuel tank let it run for 15 minutes. Turned it off. Matthew blew threw, Power went out! The neighbors were able to start the generator first pull & ran it for 8 hours. Rated 5 out of 5 by Hate Work from Used the booster during the dog days of summer... I always run high octane in my Street Glide. But when I am hitting the twisties or mountains... especially when 2-up, I add the 104 octane booster. More power is felt, especially in the lower RPMs. This isn't a night and day product. It just does what it says it will do. Nothing more. 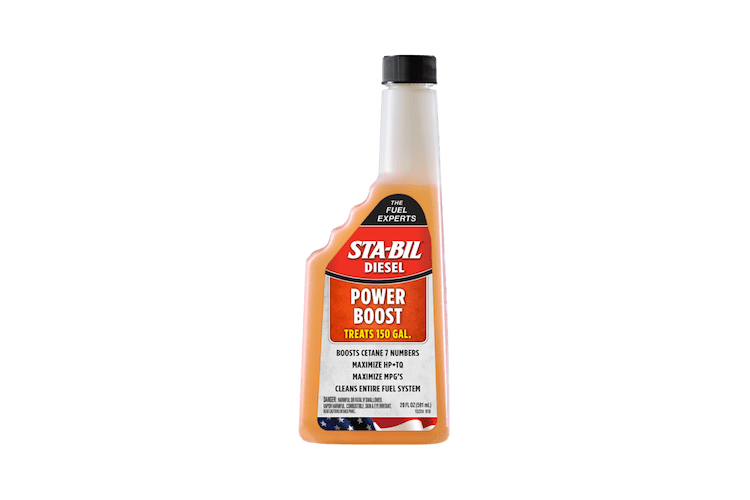 Rated 5 out of 5 by Ernie from Powersports 104 + Powersports 104, you can really notice a big difference when using the Powersports 104+, what a boost in power, and will help clean the engine. Sure glad to have tied the Powersports 104+ I will sure be using it when we fill up for the added power. Thanks for great product. Rated 5 out of 5 by richard from small engine fix I received a sample of this octane booster & decided to try it in my lawn mower thats been running slugish. Well, just after first 15 minutes running with booster addedto gas, the engine ran a lot better. No missing or lack of power! Great stuff! 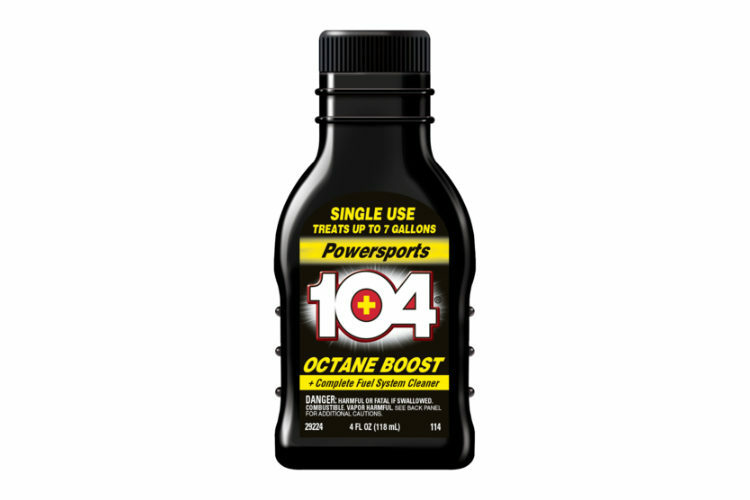 Rated 5 out of 5 by Tank from Puts the Power Back in Powersport I received a free sample of the Powersports 104 octane boost and I am very impressed. I have been alternating the Sta-Bil 360 Powersport and this in my 2006 Road King and it has greatly improved starts, idle and the acceleration is smoother.